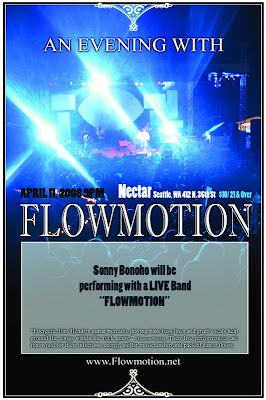 Just received the show flyer for a Sonny Bonoho performance with a live band! Apparently the way the two connected was thru a jam session that Sonny had with Lee Oskar, a former member of WAR. In that session was a drummer who's in a group called Flowmotion who said that they wanted Sonny to be a part of their set. So far as I know, he'll be on stage for four songs and hopefully more. They rehearse again this Thursday and I'm sure some more days prior to their evening at Nectar on Friday, April 11th, 2008. Should be a fun night as we see Sonny Bonoho grow as an artist and add to his resume "live band" as oppossed to just being in a box as the "typical rapper."